US, 2007, 84 minutes, Colour. Hayden Christensen, Jessica Alba, Terrence Howard, Lena Olin, Christopher Mc Donald, Sam Robards, Arliss Howard, Fisher Stevens, Georgina Chapman. 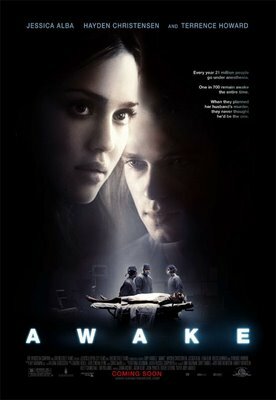 The publicity for Awake recommends that those who are to undergo surgery would be wiser not to see this film. They are right. Not because it is not an entertaining thriller, but there are some scenes of surgery which may be offputting (to say it mildly) and the opening gives a range of statistics about the use of anaesthesia – and how about 30,000 people a year stay awake, paralysed during their operation! This is enough to give qualms to anyone, even those not due to go to hospital. This is a film with heart – and without heart – in the sense that the operation concerned is a heart transplant. The subject is a very rich young New York financial entrepreneur, Clay Beresford, played convincingly enough by Hayden Christianson, who is looking much older than in his Star Wars days. He has a dominating mother, Lena Olin, who wants the best (and most boastfully arrogant) surgeon in the city (Arliss Howard) to perform the operation. Instead he wants his friend Jack (Terrence Howard) who has already saved him during a heart attack. In the meantime, he has secretly married his fiancée (Jessica Alba who does get the chance to develop her character) – just before the news comes through that a heart is available. As we expect from the title, Clay stays awake during the operation. His voiceover is often alarming and, at one stage, like a near death experience, he exits from his body, watches the operation and re-lives key moments of his life. Then there is a twist in the plot which makes it even more interesting, enough to make the audience even more edgy. But, you need to see it to find out what happens. 1. A satisfying drama? Horror? Romance? The blend for a crime thriller? 2. The New York settings, the city of New York, landscapes, skyscrapers … ? The wealth, the fishing spots, the hospital? Authentic atmosphere? The musical score? 3. The initial information about operations, anaesthetics, people awake during operations? 4. The introduction, Jack Harper and his saying he killed his friend? The flashbacks? The return to the sequence – the irony of it being true? The image of Clay? 5. Clay, the introduction, his age, wealth, living up to the reputation of his father, successful in business, the mergers, the Japanese interviews, speaking Japanese? The television comments about him and his watching them from his room? John his friend, the heart attack, helping him, bringing him back to life, their fishing together, Clay relying on him? His name on the list for heart transplants? His blood type colon O negative? His relationship with his mother, her intensity? With Sam, the relationship, living together, the announcement of the engagement, her being an assistant to Lilith? The rain, the hurt? His decision to tell his mother? Her reaction? The news about the operation? 6. Clay as a character, a good man, hopes, physically weak, love for Sam, the preparation for the operation, his reading in preparation, the anaesthetics, his counting down and his not becoming unconscious? His voice-over as the audience watched his image? Awake? 7. The details of the operation, Clay’s reaction, the voice-over, pain, his focussing, the near-death experience, reviewing his life? 8. His coming out of himself, watching the operation, discovering what was happening, the range of clues, the plan against him, the injections, discovering Sam’s betrayal? 9. Dr Lupin and his being a substitute for the operation, his background of drinking, talk, the phone calls, giving the news about the death, his observing what was happening, his giving information for the arrests? 10. Sam and Lilith, waiting for the operation, talking, Sam playing it smoothly, the bonding? 11. The twist of the plan, it’s success, Jack and his feelings, Sam and her hard attitude, the contribution of Dr Puttnam, of Penny Carver? The conspiracy? The detail of the planning, the information, getting to work as a team, Dr Lupin as an extra? 12. Lilith, her wondering about what was happening, noticing the details and the clues, the mail, the drink machine, etc? 13. Lilith’s decision to save her son, killing herself? Her meeting Clay in the after-life? Shadows and the images of life? 14. The success of the operation, Clay living? 15. Sam, her being trapped by the fingerprints on the syringe, Jack locking the door, the others trying to flee? 16. A satisfying blend of a romance, a hospital drama, a crime, the twists?